An entry in Hyman’s Handbook to Indianapolis recently caught my eye. A strange masked man stalks this great guide to the old and now mostly vanished architecture of the city in 1909. My thoughts raced to Jules Verne’s deep-sea divers, Renaissance plague doctors dressed like bizarre birds, steampunk fashion designers, and of course the epic villain, Darth Vader. 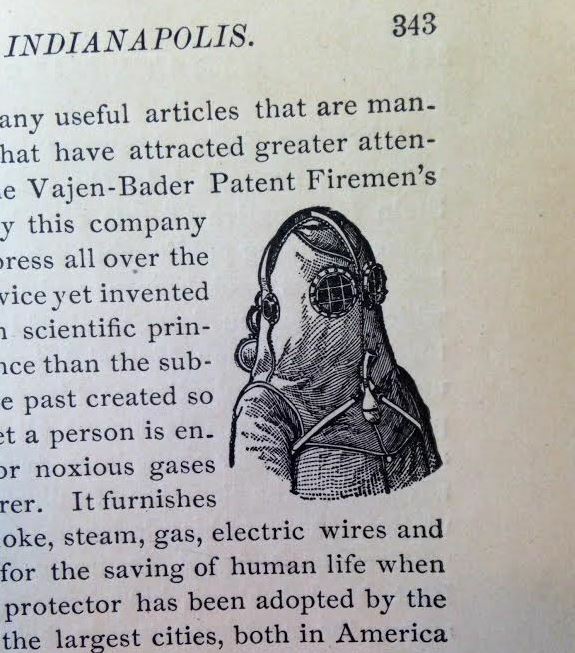 Even the name of the company that once manufactured this pioneer fireman’s oxygen mask in the Hoosier State had a science-fiction ring to it: the Vajen-Bader Company. Smoke, sulfur, and ammonia pose problems similar to those faced by divers and even doctors wading into disease-ridden “miasmas” (the “bad air” mentioned in old medical manuals). So it should come as no surprise that the invention of smoke helmets is part of a much bigger history. The tragedy is that the protective devices used by groundbreaking medical men, underwater explorers, and firefighters evolved into the gas masks used in the chemical warfare that made World War I so uniquely terrifying at the time. 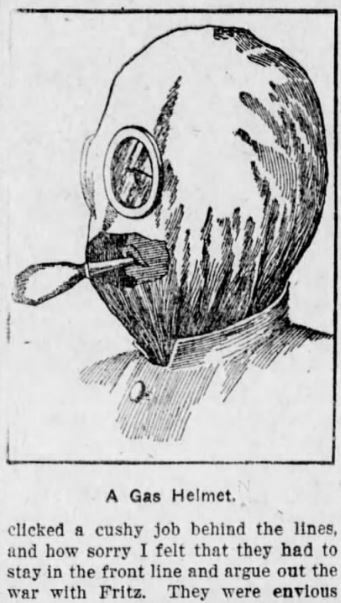 In 1893, Indianapolis hardware salesman and inventor Willis C. Vajen earned his place in the history of masks and life-saving. Salt Lake Herald, Salt Lake City, Utah, August 10, 1896. Vajen (whose name, I believe, is pronounced “Vie-en”) came from one of the capitol city’s most prominent and wealthy families. His father, John Henry Vajen, emigrated from Bremen, Germany, to Baltimore with his parents in 1836, then moved west with them to Cincinnati, Ohio, and eventually Jackson County, Indiana. (John Vajen, Sr., had been a professor in Germany, a talented organist, and a Lutheran minister, and served as pastor of a large log church near Seymour.) Vajen, Jr., went into the hardware business and made a small fortune in trading and banking. During the Civil War, J.H. Vajen became the thrifty Quartermaster General of Indiana and was known as Governor Oliver P. Morton’s right-hand man. He died in 1917. Willis Vajen ultimately followed in his father’s footsteps. After attending a seminary in Hamburg, Germany, Earlham College in Richmond, and Wittenburg College in Ohio, he, too, went into the hardware business. His sales knack probably had something to do with his skill in design. 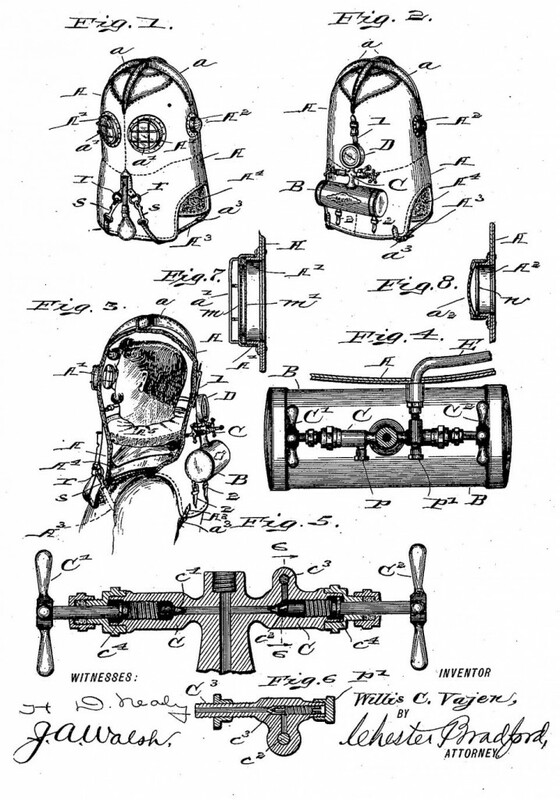 (Vajen filed patents for tools and machinery, like this plumb bob and a rein support for horses.) 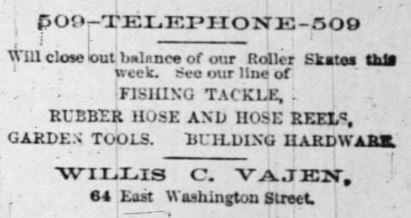 “Vajen & New” was located at 64 E. Washington St., offering Indianapolitans the best selection of lawn mowers, saw vises, rubber hoses, fishing tackle, fly-screen doors, White Mountain Ice Cream freezers, garden rakes, rubber hoses, and roller skates. 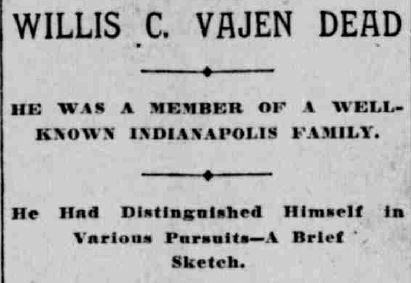 Indianapolis News, April 13, 1886. 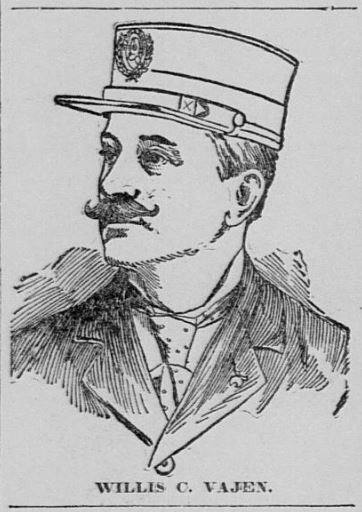 Indianapolis Journal, October 9, 1884. No mere humble merchants of garden tools and sporting goods, the Vajens married into great families. Willis Vajen was wed to Anna Claypool, daughter of the wealthy Connersville businessman Edward F. Claypool. (Ironically, the majestic Claypool Hotel, named for the inventor’s father-in-law and once one of the great landmarks of the city, was destroyed by arson in 1967.) Vajen’s sister Fannie Belle married Charles Stewart Voorhees, son of Senator Daniel Voorhees. (Charles Voorhees represented Washington Territory in Congress.) The Vajens often vacationed at their summer cottage on Lake Maxincuckee in northern Indiana, loaning it to the Hoosier novelist Booth Tarkington and his wife Laurel Fletcher in 1902. Yet Willis Vajen’s claim to fame is the “smoke protector” that he perfected with William Bader in 1893. Apparently one or both of these men had witnessed a tragic hotel fire where rescuers were unable to reach the fourth floor due to smoke, the inspiration for their efforts at invention. A German immigrant, Bader was a piano maker by profession and may have come up with the idea first. 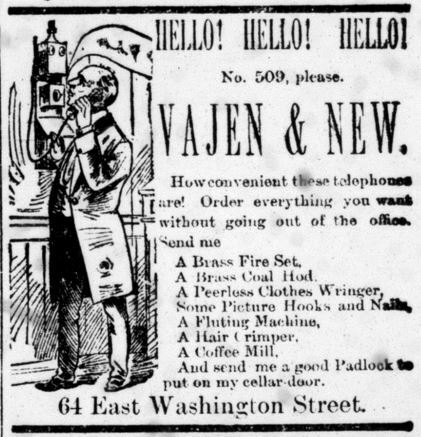 Testimony from a lawsuit filed in U.S. Court in 1899 has it that Vajen first saw a photograph of the device in the music store where Bader worked, and the two worked together to improve efficacy of the mask, meanwhile helped along by Dennis Swenie, Chicago’s fire chief. A clip in the Los Angeles Herald suggests that “William Baders” was the real genius, Vajen only “furnishing the capital for the enterprise.” The court’s verdict, however, was that Vajen deserved most of the credit. 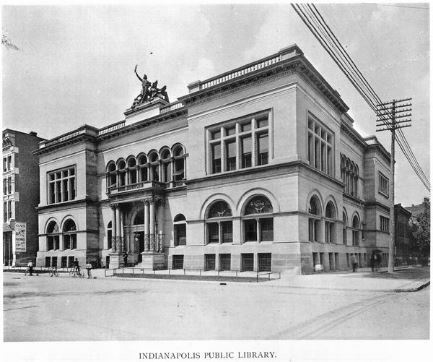 Hyman’s Handbook to Indianapolis, 1909. 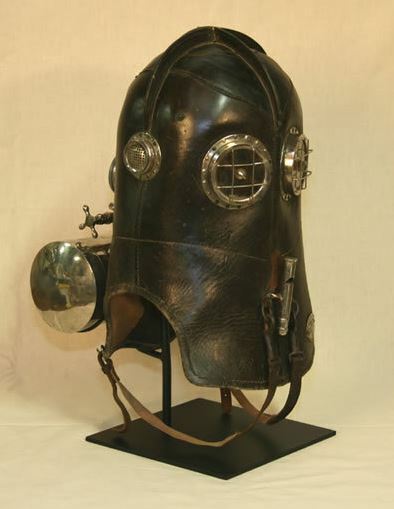 English underwater explorers John and Charles Deane invented the diver’s helmet in 1823 while figuring out a better way to fight fires. In 1893, French marine scientist Louis Boutan wore a similar diver’s suit and became the world’s first underwater photographer. 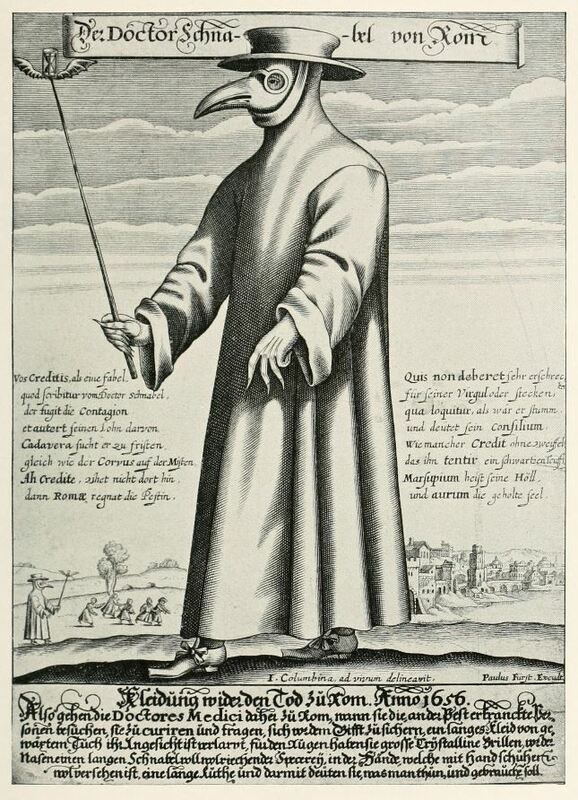 Another fascinating European forerunner of the Vajen-Bader mask was the plague doctor’s costume. While these seem like creatures of the fantastic imagination to us today, in the 17th century doctors venturing into epidemic-ridden cities sported masks resembling bird beaks, along with heavy protective suits that they believed gave protection from “miasmatic air.” Filled with scented herbs and spices like ambergris, myrrh, mint, cloves, and rose petals, the doctor’s elongated “beak” was designed as a kind of air filter. Credited to the Parisian doctor Charles de l’Orme, these ornithologically-inspired plague garments were in use as early as 1619 and later became a feature in the Venetian carnival. The crystal eyeballs and Moroccan leather in this 17th-century doctor’s get-up were oddly echoed by Hoosier innovator Willis C. Vajen, who outfitted his smoke helmets with delicate mica ear pieces to allow firefighters to hear and used sturdy leather that protected the neck and head against falling incendiary debris. Doktor Schnabel von Rom, a.k.a. 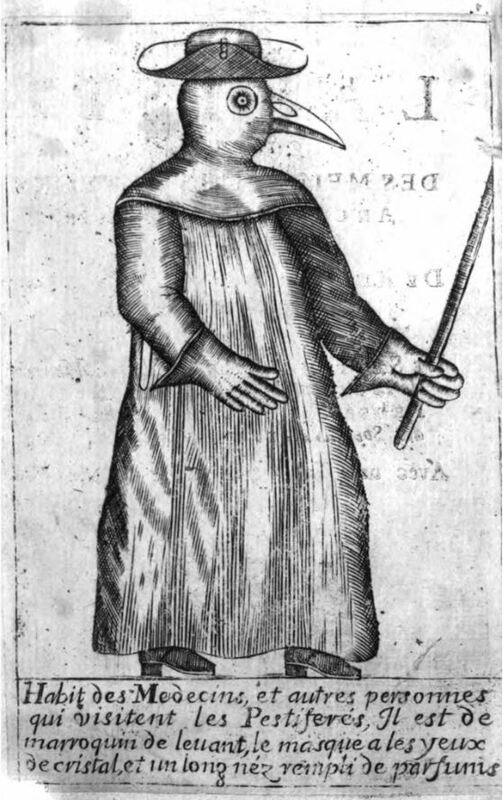 “Doctor Beak of Rome,” wears Kleidung wider den Tod — “clothing against death” — in this 1656 broadside. The engraving is written in “macaronic language,” a mix of German and Latin. 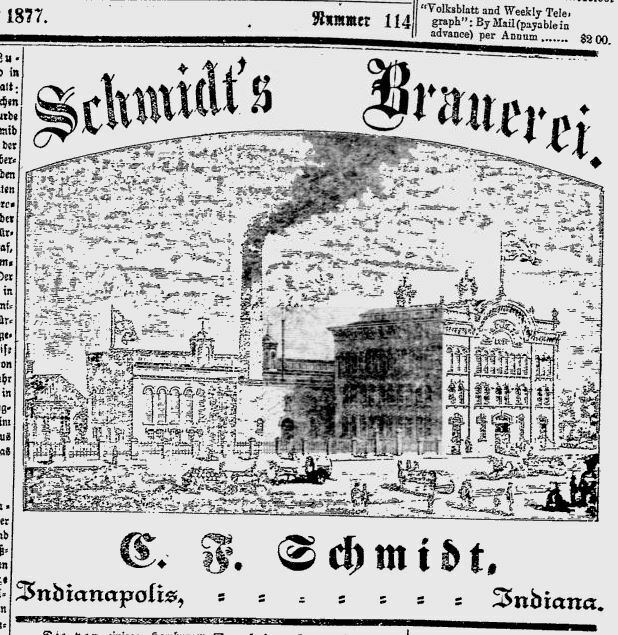 Bilingualism was also common in Hoosier newspapers. 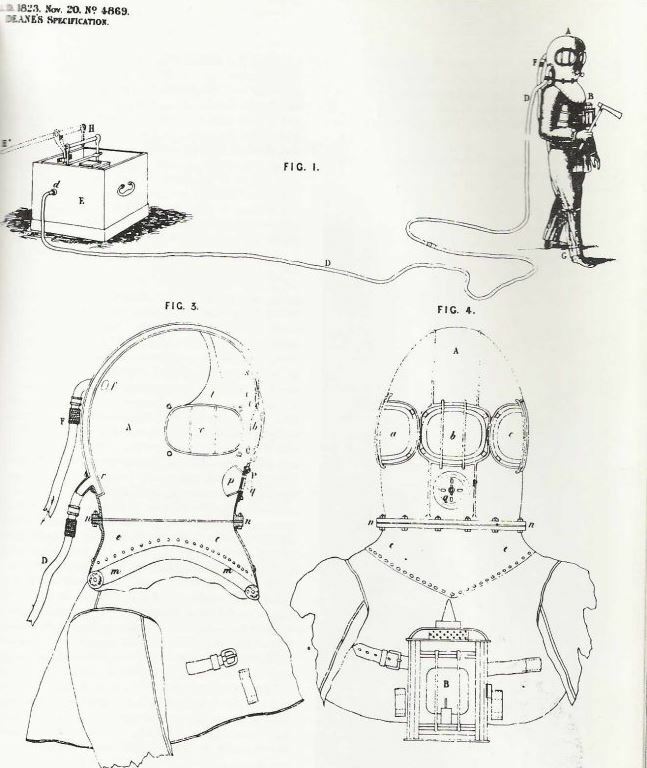 When Willis Vajen and William Bader undertook work on their smoke helmet, other innovators had already tried out an array of devices, ranging from primitive sponges and lightweight “respiratory veils” to more sophisticated contraptions, like the one invented in the 1870’s by Irish physicist John Tyndall, who incorporated a cotton filter saturated with lime, charcoal, and glycerin. A different device was the respirator pioneered by Bernhard Loeb, who attached metal air canisters to the mask’s mouth. Some two years ago Willis C. Vajen, an Indianapolis inventor, brought me a smoke helmet or protector and asked me what I thought of it. He will himself, no doubt, admit that it was a crude and cumbersome affair. The principle material in its construction was sole leather, and its window was of a single thickness or pane of glass. It did not have facilities for enabling the wearer to hear, and the tank for the compressed air was fully six times larger than was necessary. However, it was clear that the inventor was on the right track. . . As it stands now, the weight of the helmet is practically nothing, resting upon the shoulders. The protector is made of asbestus tanned horsehide and is securely fastened by means of two straps which pass from the back under the arms and snap into rings in front. Its top is padded and is also re-enforced with transverse seams of the hard leather, which stand up to the height of about an inch. This makes it capable of withstanding a very heavy blow and forms an almost perfect protection against falling bricks and small stones. Directly at the back of the neck is a small air tank, which can be filled by means of an ordinary force pump such as the bicyclists use for inflating their pneumatic tires. It will hold 100 pounds of compressed air and has a tiny gauge attached which registers the pressure of air within. The first five or ten minutes at a fire generally determines the result, and the total capacity of the air tank is sufficient to last a man for 40 minutes. A small team of workers made Vajen-Bader smoke protectors on the second floor of the old Indianapolis Public Library at the corner of Ohio and Meridian streets. Demolished in the 1960s during a period of urban renewal, the library also once housed the Board of Public School Commissioners, at a site now occupied by the downtown Sheraton Hotel. A contemporary article from the Los Angeles Herald touts the value of the smoke helmet in preventing minor fires from turning into major ones. Often a fire of insignificant proportions causes such a dense volume of smoke that it is quite impossible for its location to be discovered, and it smoulders thus until it has gained such headway that it is impossible to extinguish it. In the cellar was dug a hole, in which was placed one of the worst smelling conglomerations of combustibles ever heaped together — sulphur, feathers, tar, wooden and cotton rags and burlap sacks. Hardly had the match been touched to the pile, until a dense volume of smoke began to roll up out of the single trap door that led down into the cellar. When the penetrating fumes of sulphur set everyone to coughing, there were many who shook their heads and said no one could possibly live five minutes in the cellar. The smoke pushed its way up the brick wall and was coming out at the crevices. Second Assistant Chief Henderson was selected to wear the helmet. The cylinder was filled with air until there was a 100-pound pressure. The whistle was tested to see if it would sound. The helmet was dropped over Henderson’s head and strapped around his body. The rap door was then raised and the fireman disappeared into the sickening, penetrating smoke. The door was shut tightly. Not a breath of pure air could reach the man in the helmet. Then the crowd began to wait. Watches were looked at and after a couple of minutes had elapsed without hearing any sound from the fireman, several began to grow nervous, thinking that the sulphur fumes might have gotten in quick work and strangled him. The door was partly raised and Chief Hale called to Henderson to blow his whistle. A far-off sound came from the cellar, telling that Henderson was in good shape. . . The smoke continued to grow denser and blacker, and the odor more vile. Henderson’s whistle sounded frequently and no uneasiness was felt. Eighteen minutes had elapsed from the time when he had gone into the cellar, when he knocked on the door. . .
“How did you stand it, Alec?” queried everybody. When the pressure gauge of the air cylinder was examined it was found that only ten pounds of air had been used, ninety pounds being left. Two of this team of firefighters of Squad 52 in Cincinnati, Ohio, wear Vajen-Bader smoke protectors, circa 1920. Salt Lake Herald, August 10, 1896. The fire that started in the second story of the building in the malt mill was subdued by the fire department. 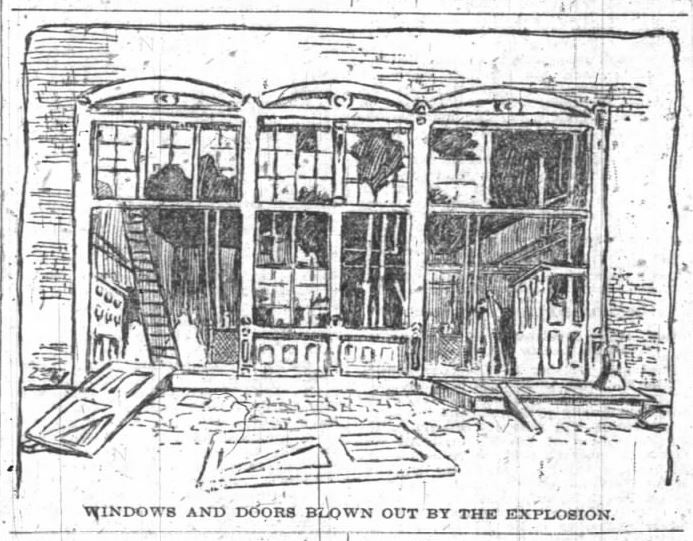 It was a hard fire to reach as the fumes of ammonia were strong, and it was almost impossible for a man to get near the building. 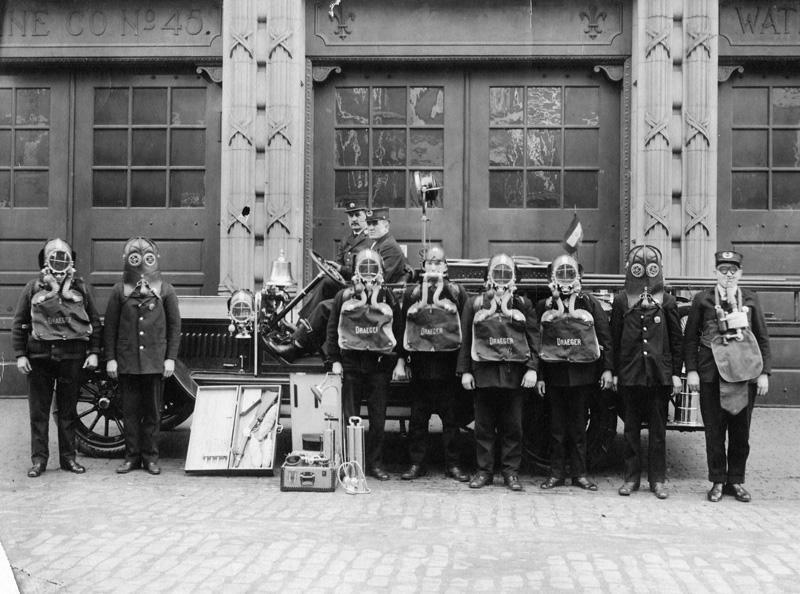 The firemen say that this is the first difficult fire they have had since the Vajen-Bader smoke protector was adopted by the department, and that these helmets made it possible for the men to enter the building and reach the fire with the chemical engines. 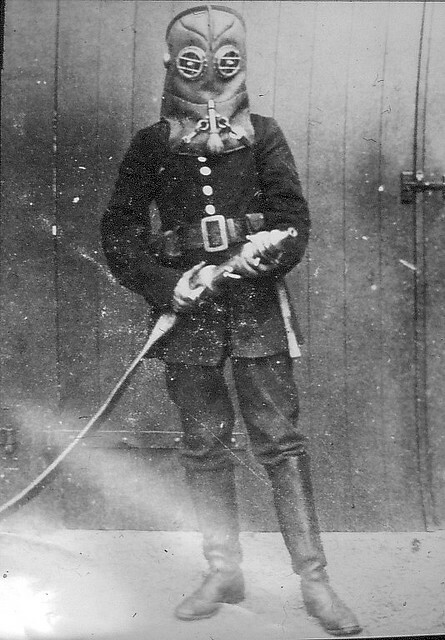 They say that although the fumes of ammonia were strong enough to render an unprotected fireman unconscious, the men wearing the helmets suffered no inconvenience from the fumes. Aged 49, Willis Vajen, who suffered from life-long anemia, died at his home at 23 E. Vermont St. on July 22, 1900 and was buried at Crown Hill. In one of history’s bizarre twists, all the houses on Vajen’s block were demolished around 1921 to make way for the mammoth Indiana World War Memorial, the city’s enormous Egyptian-inspired temple to the veterans of World War I. These soldiers, of course, were the first to use the terrifying invention whose evolution was partly due to the Vajen-Bader smoke protector. Early in the 20th century, the gas mask wove its way into sickening nightmares, both dreamed and awake, as Europe — and then the whole world — caught on fire. 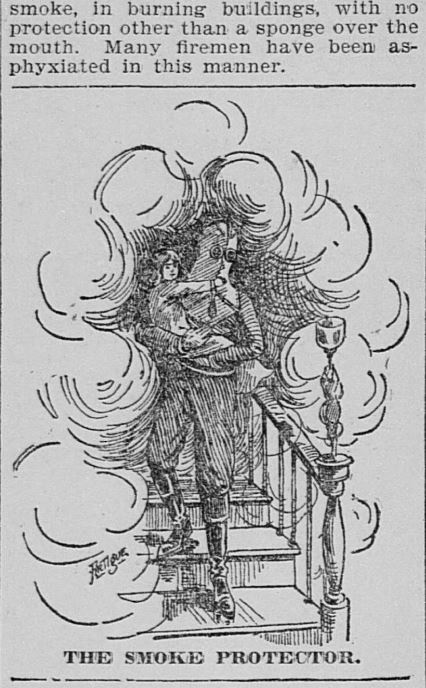 Altoona Tribune, Altoona, Pennsylvania, March 26, 1918. 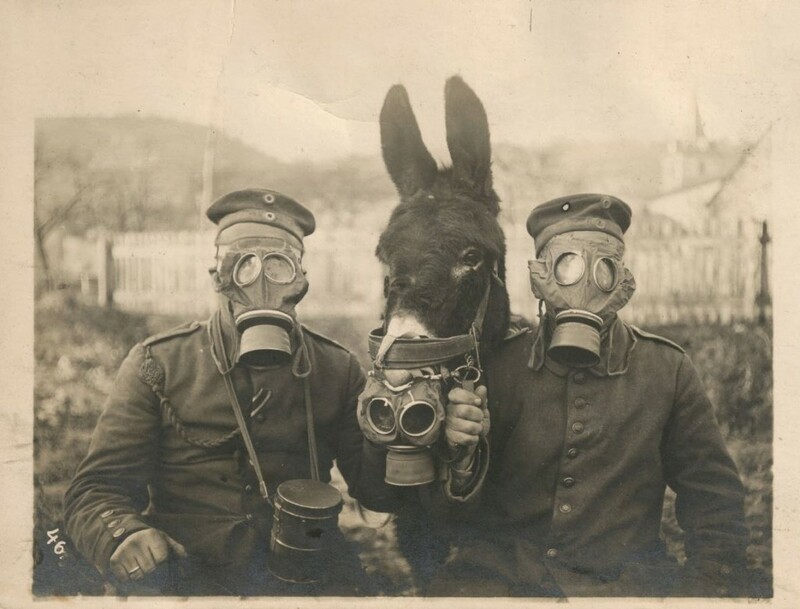 German soldiers and a mule wear gas masks on the Western Front during World War I. Spike-helmeted firemen in Berlin’s Fire Department had already supplanted the mule and the horse with the bicycle as early as 1899, as shown in this issue of the Louisville Courier-Journal. 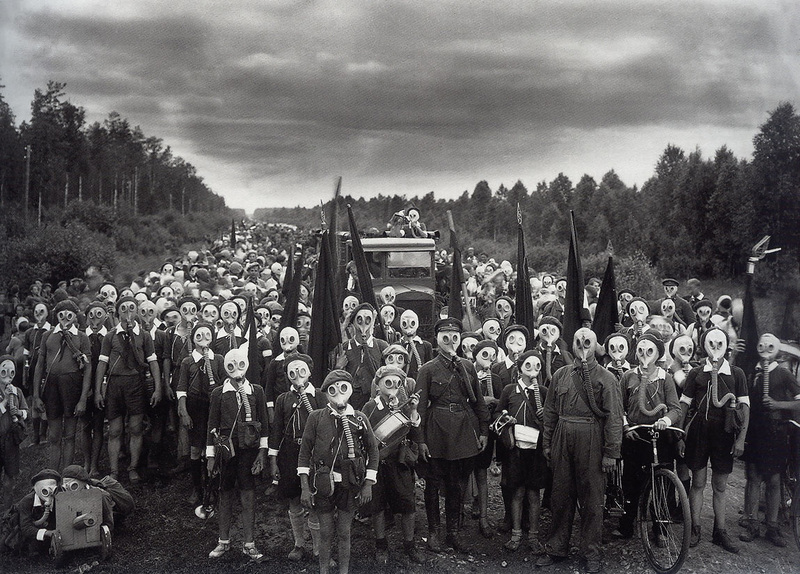 Young Pioneers Defense, Leningrad, Russia, 1937, by photographer and early filmmaker Viktor Bulla. 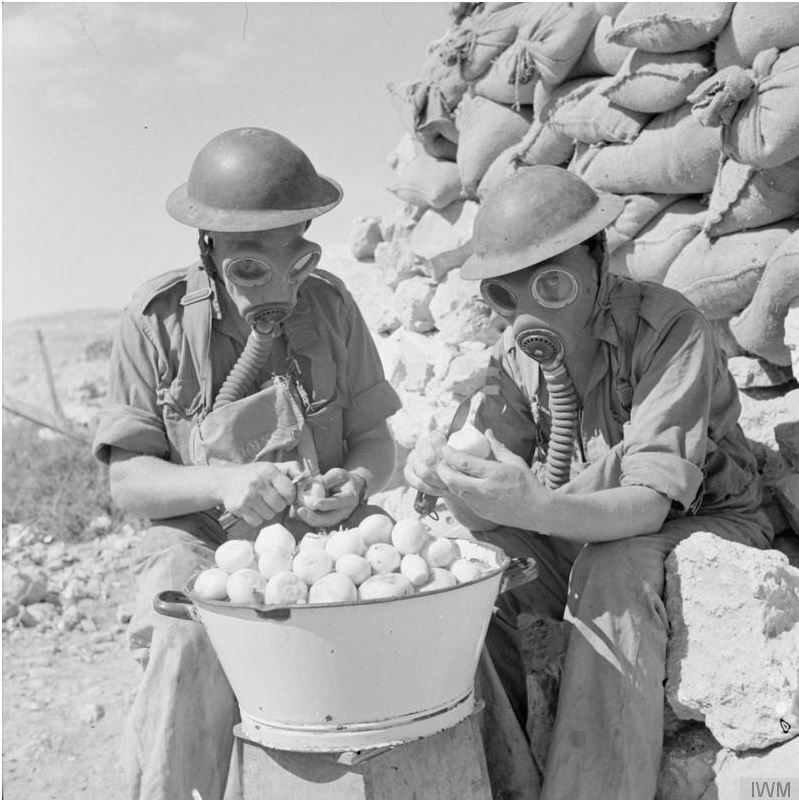 American soldiers peel onions while wearing gas masks in Tobruk, Libya, during World War II.